Adama ponders the moral questions of releasing a “bio-weapon” against the Cylons. Responding to Apollo's report from the science deck that Cylons are boarding the ship from a hole blasted into the hull, Commander Adama tells him there are D-com warriors on the way. "D-com" seems to be a reference to "decompression"; warriors later show up in environment masks to battle the Cylons. On page 2, an incredulous Dr. Wilker asks Starbuck, "Are you out of your Umbran mind?" This is a reference to Starbuck's home village of Umbra on Caprica as a child. It may also be a nod towards Dr. McCoy's frequent insults toward Mr. Spock in Star Trek, as in, "Are you out of your Vulcan mind?" On page 3, Starbuck tells the invading Cylons, "Eat this, daggit frackers!" In colloquial English, he's basically calling them "dog fuckers". On page 6, Colonel Tigh reports on a detonation in space "less than a metric away." In Colonial parlance, a metric is about one Earth kilometer. On page 7, Greenbean appears for the first time since "The Leiter Side of Life". On page 8, Boomer refers to the captured Cylon centurion as a Mark V standard combat model. Presumably the Mark V's are the silver centurions we see throughout the televised episodes. In "Berserker" we met an exiled Mark III Cylon, built 1,000 yahren ago; it would seem the Cylons do not bring out new models often! On page 9, Abbadon refers to the Imperious Leader as Lord Barkol. The Battlestar Wiki suggests that the name "Barkol" is a misinterpretation of the word "debacle" spoken by Lucifer in "The Gun on Ice Planet Zero" Part 1. As Starbuck regains consciousness in the life center on page 10, he mistakenly refers to Cassiopeia as Aurora. Aurora was an old flame of his on Caprica before the destruction of the Colonies, last seen in "Take the Celestra". Cassie, in return, calls him a Boray. Borays are bipedal, boar-like creatures of at least some intelligence who terrorized the town of Serenity on the planet Sectar in "The Magnificent Warriors". Further, it seems that the Colonies were familiar with Borays in that they have been known to use the epithet "Borays of humanity" (as heard in "Exodus"). Perhaps the term "borays" was already in use in the Colonial language and later applied to these boar-like creatures by the human émigrés to Sectar. The miffed Cassie goes on to say to Starbuck that she should never have forgiven him for the Rising Star. Possibly she actually meant the Celestra, since that is the ship on which Aurora is stationed. Another possibility is that she is referring to the incident when Starbuck was juggling both Cassie and Athena in two separate private suites on the Rising Star at the same time in "The Long Patrol". Although he sometimes gets it correct, artist Rafael seems to have trouble remembering that Apollo wears his holstered weapon on his left hip, not his right. On page 11, Adama remarks that the Cylons rejected their biological origins thousands of yahrens ago. Also on page 11, Dr. Wilker uses the term "wavelons". This is the Colonial term for "wavelength". 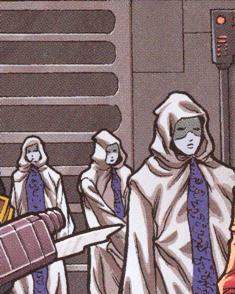 On page 18, we see several Cylons in the city of Tessida who wear similar cloaks to the ones seen in "The Living Legend" Part 2, but the constructed faces are more humanoid-looking. On the last page, Apollo quotes a wise man as saying, "The Cylons hate us with every fiber of their existence." This wise man was Commander Adama in "Annihilation".